Movie Vomit Bags For The Holiday! Classic “Mark Of The Devil” Stunt! 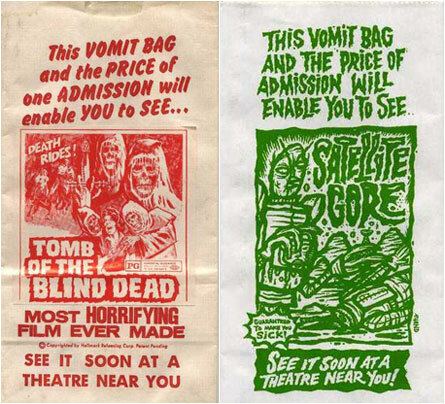 Best Vomit Bags In Cinema History! – JR-Sploitation! 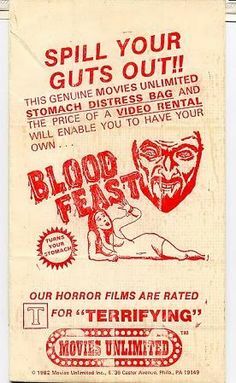 Home › 70's Films › Movie Vomit Bags For The Holiday! Classic “Mark Of The Devil” Stunt! Best Vomit Bags In Cinema History! This 1970 film was notorious for scenes of torture – and much was made of the film’s most disgusting elements – if you aren’t familiar with this film, you have missed out on a “euro-sleaze” classic! 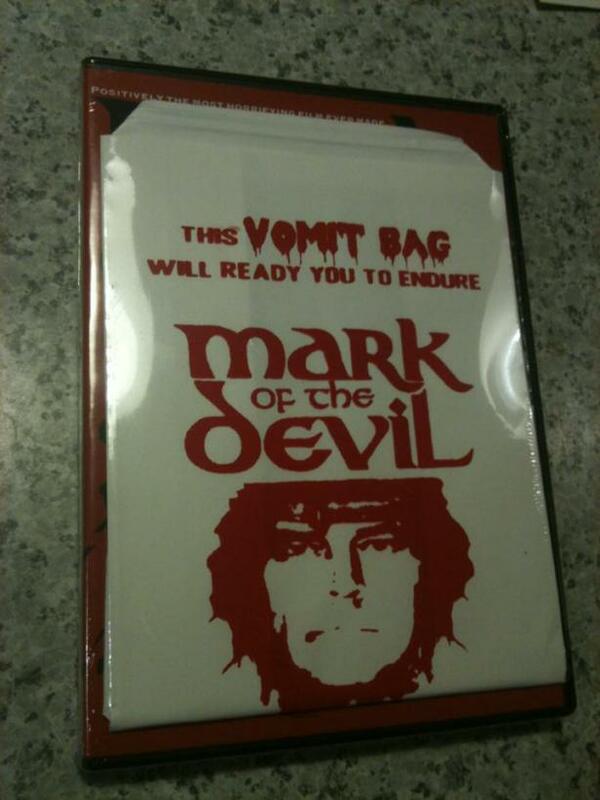 “Mark Of The Devil” was just one of many movies that used this form of promotion – for example, “When The Screaming Stops” also came with a vomit bag – but remember, “DO NO RE-USE!”! When the films were advertised in newspapers – and even in the trailer – much was made of the unprecedented violence in the films, so much blood that the audience needed to be warned! 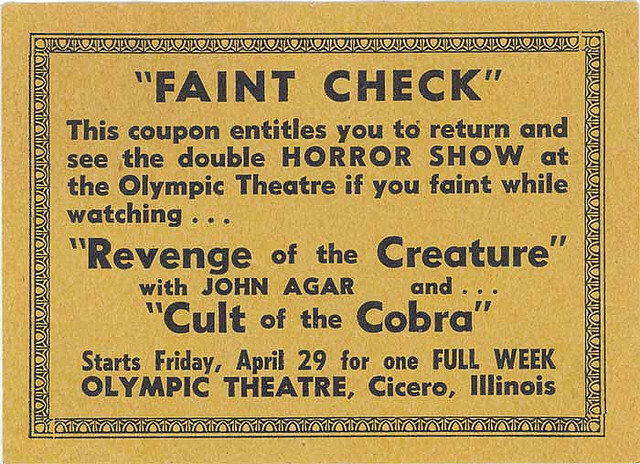 And the hits kept on coming – even movies with virtually NO gore at all, like “Tomb Of The Blind Dead”! “Death Stop Holocaust” – WHAT!?!?!?!?!? 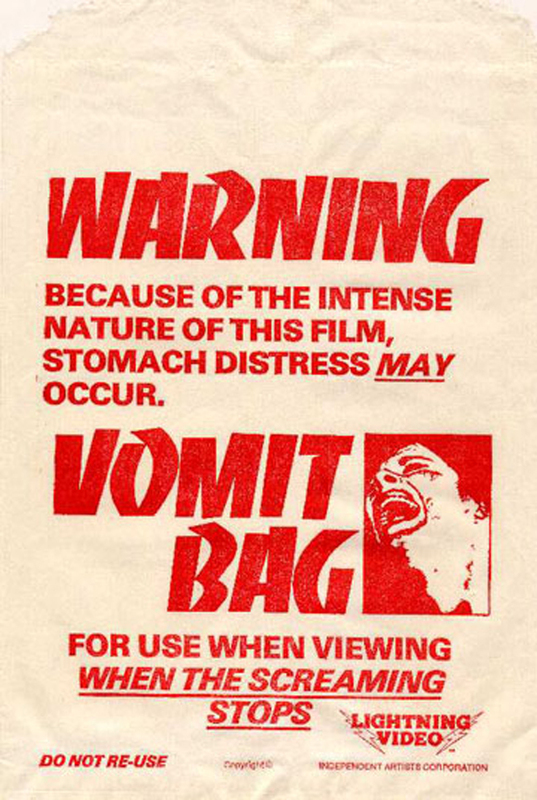 And what about this film – I’ve never heard of it, but the vomit bag was MANDATORY! 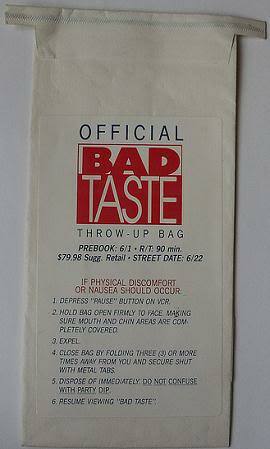 And for the film “Bad Taste”, they didn’t offer vomits bags, they just called it the way they saw it, and gave out “throw up” bags! And how about this, a claim check that will allow you to come back for another screening if the film make you pass out! 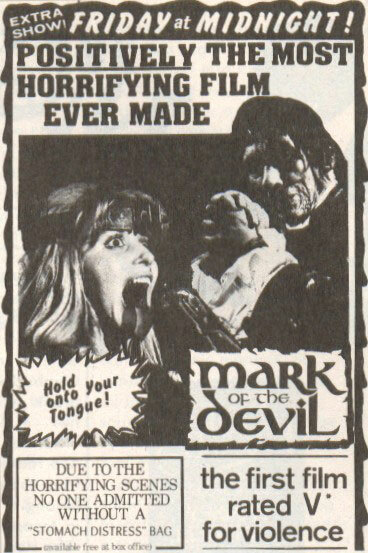 These are all hilarious movie gimmicks, and they worked too, because “Mark Of The Devil” was a big grindhouse hit…let me know if you saw it, and if you needed the bag! Much credit for these shenanigans must go to legendary exploitation Producer David F. Friedman, known for his crazy gimmicks to drive audiences wild! And let’s not forget who is keeping the spirit of independent cinema alive – with their latest movie in theaters and soon to be unleashed on blu-ray! 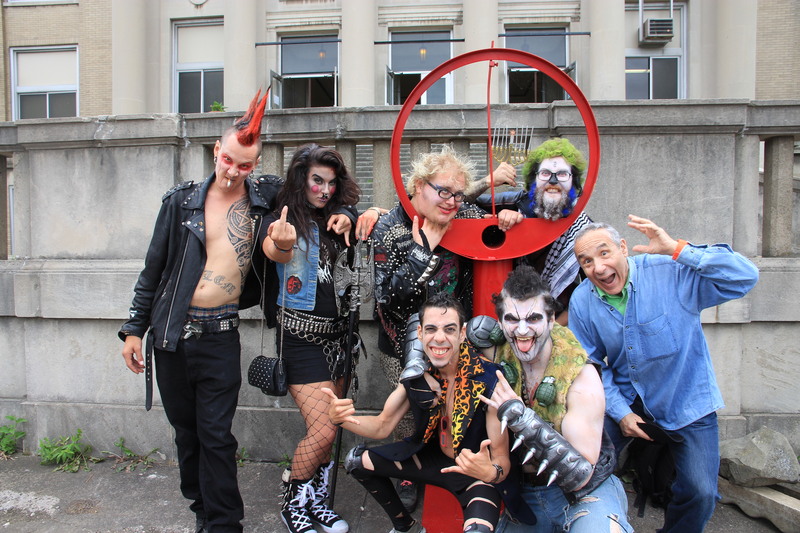 That’s right, Troma President and great filmmaker Lloyd Kaufman is back with his latest “Tromasterpiece” – read all about it here! 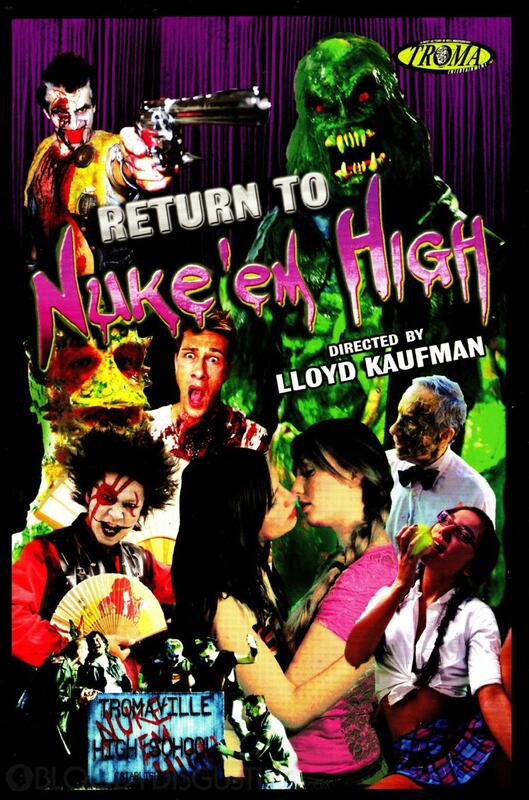 Make sure you support Troma by purchasing “Return To The Class Of Nuke ’em High Pt. 1 and 2” – it keeps independent cinema alive – and you get a great movie to boot! ‹ The Movies That Will CLEAR OUT Your Holiday Guests! How To Close Down Your Party – “Grindhouse” Style! That trailer reminded me of the Hammer film, ‘Witchfinder General’. That is considered to be something of a cult classic over here. Yes indeed Pete on both counts? Have you seen it? A nasty little film that is very watchable! No. I hadn’t even heard of it, until I saw your feature. I am proud to say I saw “Mark of the Devil” on its initial release and still proudly display (right next my “When Dinosaurs Ruled the Earth” caveman dictionary) my vomit bag (unused, I hope I didn’t have to add) as a treasured momento of many gloriously misspent hours at the movies. Just love that “Do Not Re-Use” notice. This brings back memories of seeing “Andy Warhol’s Frankenstein” during which I was getting restless (boredom not discomfort), when, during a particularly gruesome scene, the person sitting two rows in front of me started vomiting (sadly, for the management’s sake, sans novelty bag). Now we had a show! Similarly (I digress, but it’s what I do), there was that time when during the first run of Michael Winner’s “Death Wish” that a scuffle broke out in the back of the theater involving two gents and a very excitable woman who kept taunting one of the men saying “You wouldn’t dare hit a woman!”, to which the fellow in response laid on a roundhouse swing that sent the woman cartwheeling over the row in front of her. Naturally all kinds of hell broke loose in the back rows. Naturally everyone else disinterestedly returned to watch the Bronson screen mayhem. Gotta love the movies.